"There's a negativity around them because predominantly they're female," she said at the Toronto Film Festival. The British star of Atonement, Pride and Prejudice and The Imitation Game is back in period garb in Colette, a biopic of the French novelist. She said she had often considered swearing off the genre, only to be lured back by strong scripts. "The strongest characters I've found have been in period roles," said the 33-year-old, whose other films include four entries in the Pirates of the Caribbean series. Colette concentrates on the early years of the writer born Sidonie-Gabrielle Colette in January 1873. Central to its plot is her relationship with her first husband Henry Gauthier-Villars, who wrote extensively under the titter-inducing pseudonym Willy. 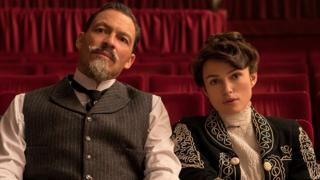 The film sees Willy, played fulsomely by Dominic West, encouraging Colette to write successful novels only to take the credit for her accomplishments. It also addresses her sexual dalliances with lovers of all genders and her ventures into flamboyant live performance. Knightley said she "instantly felt connected" to the writer's history, which she found "very relevant" to current discussions about gender roles. "It's the story of a woman who's finding her voice and her true self and allowing herself to live courageously," she went on. "I stood very tall when I played Colette," added the actress. "She was a maverick." The fact that some of Knightley's best-known films have been costume dramas have seen her become indelibly associated with the corset. Part of Colette's appeal, she said, was the dispensing of that particular garment "so she could be more relaxed and in her own skin." The actress admitted she "looks great in a gown" but insisted there were other factors connecting her career choices. "Since I've been lucky enough to choose my roles, I've predominantly tried to play complex, interesting, well-rounded women," she said. "If there's something that joins the career together, apart from the corsets, then hopefully it's that - with the occasional money gig thrown in as well." "I try and find characters who inspire me, and that doesn't mean saints," she continued. "The slightly more morally ambiguous women are the ones that I'm interested in. I look for women I can recognise." Colette, directed by Wash Westmoreland of Still Alice fame, is one of several films about female writers to screen at Toronto. Others include Vita and Virginia, a depiction of Virginia Woolf's relationship with fellow author Vita Sackville-West, starring Gemma Arterton and Elizabeth Debicki. Jeremiah Terminator LeRoy, meanwhile, tells of a young woman, played by Kristen Stewart, who becomes a stand-in for her sister-in-law's literary persona. First seen at the Sundance Film Festival in January, Colette will have a gala screening at the London Film Festival next month ahead of its UK release on 25 January.